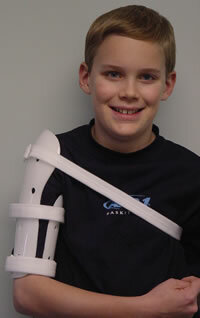 The Humerus Fracture Brace controls fracture position through soft tissue compression. The extended length prevents distal migration and a bivalve design allows easy application. It is constructed of polyethylene laminated with closed cell foam lining, contact closures, and includes two sleeves. Fits left or right. Child XS 11.5" 7-9" 5-7"
Adolescent S 12" 9-11" 7-9"
Youth Med M 12.5" 11-13" 9-11"
Youth Lg L 13" 13-15" 11-13"